Brothers in Arms: For Country or King? Two epic events in world history occurred in Europe one century ago: the Easter Rising in Dublin and the Battle of the Somme. 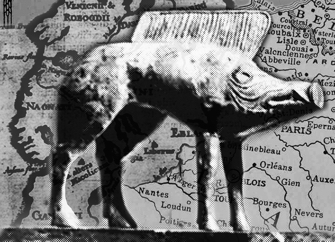 On May 5, 6 and 7, Cinémorphe, Paris’s first immersive theater company, will present “192016: Unto the Valley of the Black Pig,” inspired by those events, at the Irish Cultural Centre in Paris. Erik Rehl, director of the production, talked to Paris Update about Cinémorphe and what to expect from this original piece. What’s the story behind Cinémorphe? Cinémorphe was founded by Romilly Walton Masters, Lucy Dixon, Carmela Uranga and myself in 2011, when we produced our first show, “Soiree Exceptionelle.” The idea of immersive theater has been a hot ticket in many cities and countries, but not so much yet in Paris and France, although its popularity is growing. I trained in theater at Swarthmore College in the United States, then the Moscow Arts Theater and Central Saint Martins College of Art and Design in London, where I received an MA in scenography. How did “192016” come about? 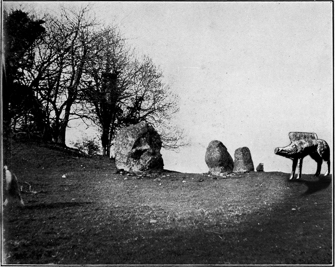 Romilly, who had a comprehensive knowledge of Irish literature, history and culture, had the original idea for the show. An epic story of two brothers who follow different paths is not a new tale, but given that 2016 is the centenary of the Easter Uprising and the Battle of the Somme, there were plenty of urgent reasons for staging this show. Since Romilly passed away so tragically last year, it must be difficult to carry on without her. It is slightly daunting, but we had discussed the premise of the current show and developed a few ideas for staging, so it has been a natural progression of the work already begun. Inspired by historical events, ancient mythologies and the epic nature of human conflict, it’s an immersive theater experience that follows the stories of two Dublin brothers and their divergent journeys – one joins the rebels to fight for the Nationalist cause and the other joins the Irish 16th Division of Kitchener’s Army on the Western Front. What are the parallels/differences between World War I and the Rising? 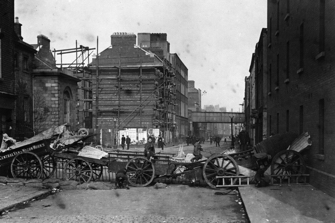 Barricades during the Easter Rising in Dublin. defend one’s ideals. The great similarity was the manner of fighting and the mechanization of warfare used in the bombardment of both the Western Front and the centre of Dublin from British battleships on the Liffey. The cycle of war seems to continue despite all the tragic repercussions and deep histories connected to both World War I and the Rising. It is from these perspectives that we are invited to engage with the worlds of Dublin and France at a time when orations were idealistic as rebels rose and soldiers fell in unequal numbers but not incomparable loss. Why is the W.B. Yeats poem “The Valley of the Black Pig” referred to in the title? lineage and significance in Irish mythology, first as a fertility god and then, centuries later, as a potent deity of war and destruction. The valley is the ancient plain of battle between the forces of light and the forces of darkness. By adding “Unto” to the title, we put ourselves and the audience on the cusp of this plain, offering a choice between entering or watching from afar. How big is the cast and who is in it? We have a cast of 24, including musicians. Serge O’Sullivan plays the Nationalist brother and Liam Taylor the brother who joins the Irish 16th Division, with June McGrane as their mother. Lucy Dixon, Lena Ashwell and many more are also part of the cast. What will the experience be like for spectators? The audience will encounter different characters and various settings in different parts of the beautiful 18th-century Irish Cultural Centre, with its large courtyard. The experience can be challenging because of the close proximity between performers and audience, but we’ve become very good at encouraging even the most hesitant members of the public to engage! Will they be obliged to participate? No, but they get more out of it if they do! Is the production bilingual or English-only? The show is bilingual, with many accents. Should spectators read up on the Easter Uprising and the Battle of the Somme beforehand? It’s never a bad thing for audience members to take an interest in the subject matter of a show they are going to see. That said, our show doesn’t necessitate an in-depth knowledge of the Easter Rising or of World War I. Is there a dress code for the audience as there has been in previous productions? No, but the audience is invited to dress in period (1916) attire. How might the production change from one night to another? As the audience changes, so can the interactions, as there may be more or less participation. Will there be any surprises or mysteries to unravel in this production, as there have been in past shows? There won’t be the same kind of mysteries as in past productions, when we were asking the audience to guess which film or novel had inspired us, but there will be a number of scenes and interactions to keep the audience engaged. We hope they will leave the show discussing and debating the stories they have encountered. Any future productions on the back burner? We have a number of projects in development, including inquiries for private events. I would like to thank the Irish Cultural Centre for its support and the Walton Masters family for generously making Cinémorphe the inaugural recipient of the Romilly Walton Masters Award, which supports experimental theater, dance and art. Click here for more information on Cinémorphe.